The new State Library Station at the northern end of Swanston Street will improve access to some of Melbourne's most popular destinations including the State Library of Victoria, RMIT and the Queen Victoria Market, and cater for the area’s growing student population. 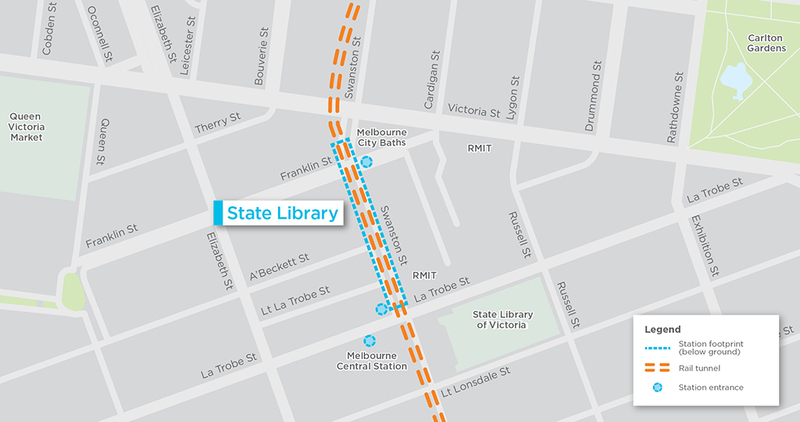 The new State Library Station will be located under Swanston Street, between La Trobe Street and Franklin Street. 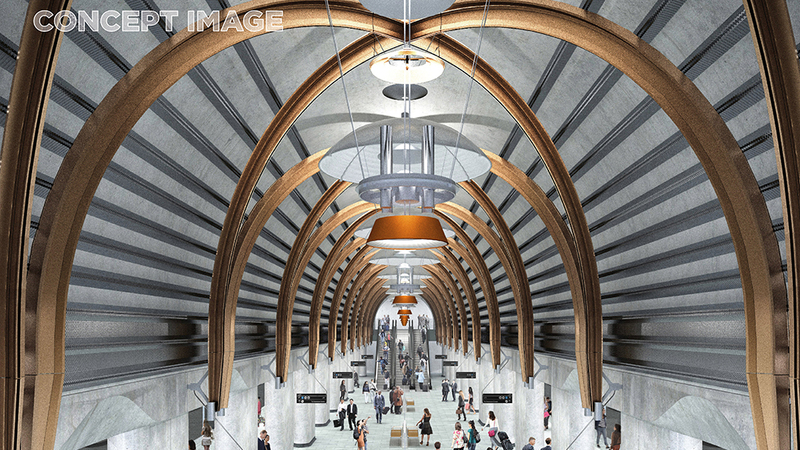 It will include an underground passenger connection to Melbourne Central Station, allowing commuters to conveniently interchange between Metro Tunnel and City Loop train services. 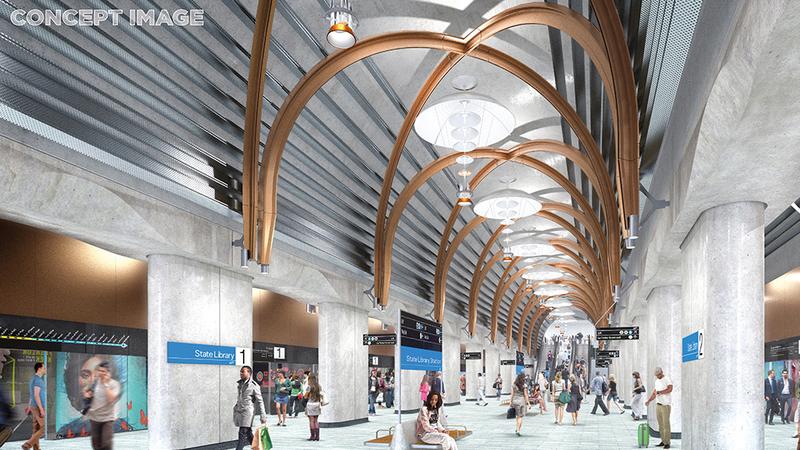 The new station will have three entrances, including the underground connection directly into Melbourne Central station. At street level, the main entrance will be located near the corner of Swanston and La Trobe streets, providing easy access to RMIT and the State Library of Victoria and northwards to Literature Lane and Stewart Street. Another entrance will be located on Franklin Street near the corner of Swanston Street, between RMIT and the Melbourne City Baths. The new State Library Station will be a northern gateway to the city, and the surrounding precinct will be transformed to provide better spaces for pedestrians, cyclists and the area’s growing residential community. Franklin Street will be transformed into a pedestrian promenade between Victoria and Stewart Streets, with wider footpaths, dedicated on-street bicycle lanes and reduced traffic speeds. The improvements will contribute to the transformation of Franklin Street up to the revitalised Queen Victoria Market. The footpath on the southern side of the street will be widened to become a linear park with areas for socialising, outdoor dining, shade, gardens and public art. Existing laneways at Literature Lane and Stewart Street will be revitalised and extended to provide connections into the new station, opening up new walking routes and evenly distributing pedestrians around the precinct. A’Beckett Street will be permanently closed to through traffic between Stewart Street and Swanston Street to create a new public space, with recreational facilities, seating and a new outdoor dining area. A reconfigured Swanston Street will enable widened footpaths, increasing space for pedestrians outside the new station and creating space for new trees to be planted. Station entrances located next to existing tram stops on Swanston and La Trobe streets, allowing for easy interchange between trains and trams. Improved bicycle safety with an 80 metre section of local vehicle traffic removed from the western side of Swanston Street, between Little La Trobe and A’Beckett Streets. New on-road bicycle paths on parts of Swanston Street and along Franklin Street. More than 70 new bike parking spaces. 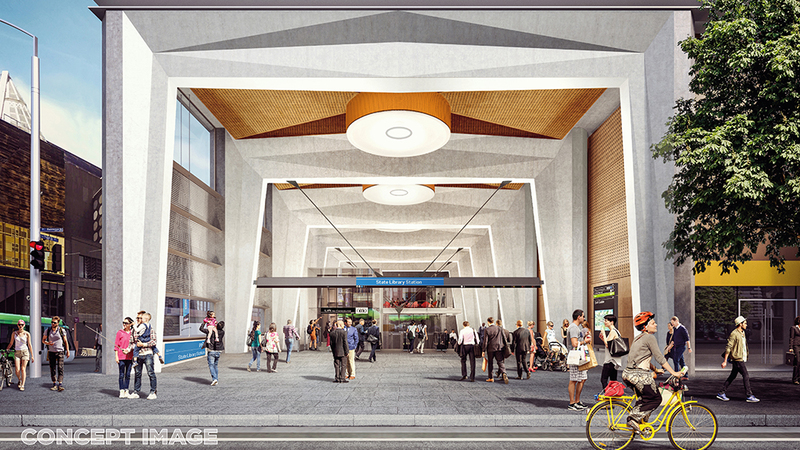 The State Library Station precinct will create 3,500 square metres of new public space from reconfigured road space. Design for the wider station precinct includes a 50% increase in trees across the precinct, particularly at Franklin and A’Beckett streets. Boulevard-style tree plantings along Franklin Street will help transform the street into a landscaped corridor to encourage walking between the station and the Queen Victoria Market. This corridor will be landscaped with a diverse range of plants. Water sensitive urban design principles have been integrated into the design of the State Library Station precinct to lessen flood risk in low lying areas, reduce stormwater runoff and provide passive irrigation to plants, thereby reducing demand for potable water. Areas that receive high stormwater runoff will be landscaped to cope with heavy rainfall, and new tree pits will contain large soil volumes to provide passive irrigation. The State Library Station precinct is highly developed and includes a mix of contemporary and heritage architecture in a streetscape that has seen significant change and building works over the past few years. The Franklin Street station entrance outside RMIT will be located within a landscaped setting, with the entrance structure in line with the height of nearby trees. Landscaping to create a visual break between the hard surface of buildings and Franklin Street will provide a new space for students and locals to enjoy and relax. Outside the Melbourne City Baths, widened footpaths will increase space for pedestrians and allow for trees where there currently are none. The existing memorial to Aboriginal prisoners wrongly executed on the corner of Victoria and Franklin Streets will be retained.